When asked to consider the role that digital images play in our understanding of and engagement with works of art, I was drawn to exploring parallel questions about non-visual artworks. I think most of us can agree that a digital reproduction (or any form of reproduction, really) can never replace an in situ encounter with a painting, sculpture, performance piece or installation–or even viewing a photograph in person, despite its own status as a reproduction. But what about audio works like Michael Rakowitz’s The Breakup: A Project for Jerusalem, comprised of a ten-part radio series and a live home to and reenactment of the Beatles’ last concert that the artist created for a 2010 exhibition in Jerusalem? Of course, the concert was a one-time-only event, but all ten radio episodes can be accessed through the project’s website. I began to think about how artists’ websites also function as archives. I wondered if, in some cases, it was possible for a website-archive to serve not just as an image repository but to also provide a way to extend an artwork’s life indefinitely? But wait: Let’s take a few steps back and consider the project’s original context. 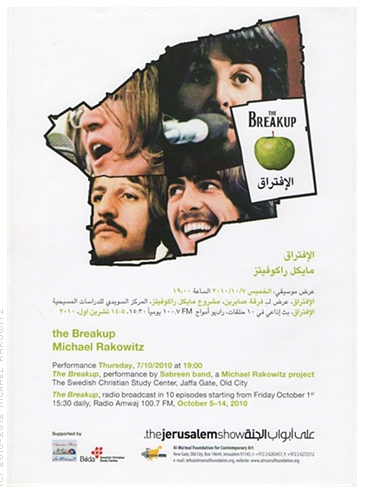 Written and narrated by Rakowitz and broadcast over a series of October evenings through a Palestinian radio station in Ramallah, The Breakup blends documentary, autobiographical and poetic elements to offer a sustained exegesis on the events, emotional and otherwise, that led to the Beatles’ demise. At the same time, its narrative also draws connecting lines between that band’s ultimate inability to “come together” and the collapse in negotiations between Israel and Palestine, and going back even further, to the Middle East’s failure to unite under the banner of Pan-Arabism in the late 1950s and 1960s. Rakowitz created the show in response to the exhibition’s call for works addressing the context of and conditions faced by the occupants of Jerusalem, the city at the core of the Israel-Palestine conflict which is itself “broken up” into alienated parts. Working from archival material—a complete, 150-hour set of raw audio tapes of the Beatles, recorded during the so-called “Get Back” sessions by Michael Lindsay-Hogg, who was filming the documentary Let It Be at the time—Rakowitz crafted an alternative Beatles’ narrative that, although it doesn’t significantly depart from Lindsay-Hogg’s construction of events, nonetheless homes in on key moments and factors leading up to the end we already know is coming: John and Paul’s rivalry, Ringo’s apathy, George’s sense of isolation from the others, the incursions of Yoko Ono. I don’t know if this enforced propulsion was due to technological limitations, copyright issues, or something else, but I didn’t have to listen for long before I recognized that the restrictions make perfect conceptual sense. The Breakup is about fruitless attempts at return, about the impossibility of moving backwards in time. “Get back…back…back…. Rewind. Rewind further…there. The beginning begins.” Rakowitz says this early on, soon after the start of the series’ first episode. The desire is primal: to “get back” to where you once belonged, and to get back what once belonged to you. But let us get back to the questions I posed at the beginning. 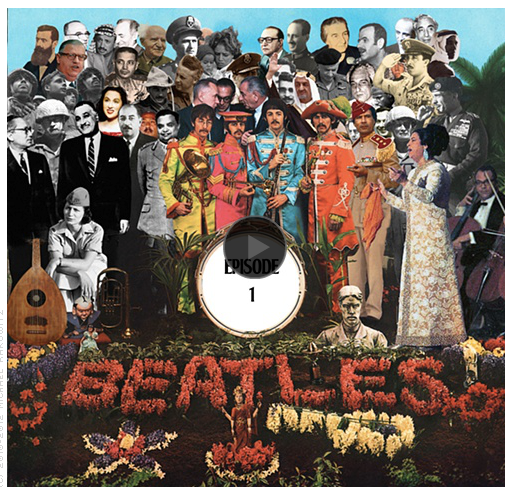 To my ears at the time of listening, The Breakup’s narrative seemed heavy on Beatles analysis and surprisingly light when it came to addressing the situation in the Middle East, its history of lines drawn and redrawn, of promises made and broken. Or maybe I just couldn’t hear everything Michael Rakowitz was saying. In the end, I still think context is defining. The place I couldn’t “get back” to was one that had never been possible for me to reach: the work’s first Radio Amwaj broadcast in Ramallah in October of 2010. I can’t know for sure, but I suspect that, were I another woman–a woman not unlike myself and yet in many ways so dissimilar from me, living in that troubled yet vibrant city I can read about with a mouse click, but which still seems very far away from where I sit now–if I were that woman instead of me, living there instead of here, I would have heard Rakowitz’s words differently. Throughout the program, Rakowitz’s cadence is steady and measured, his tone gentle, not unlike that of a father reading a bedtime story to his child. But the underlying message of The Breakup is a tough one: you can’t rewind, and you can’t fast-forward past present difficulties either, no matter how exhausted you feel, how desperately you want to get to that hoped-for place of future promise. All we have is now, and if “now” sometimes seems unbearable, Rakowitz, towards the end of “Episode 5”, offers consolation through the phrase that memorably titled George Harrison’s first post-Beatles solo album: all things pass. This, too, shall pass. This is the fourth essay in the OPP Art Critics Series. Read the previous essays: "Look at Them, Please" by Danny Orendorff, "Autobiography and Its Documentation" by Jason Foumberg, "The Child is (Un)dead: Taxidermy Art as Victorian Post-Mortem Photography" by OPP Art Critics Series' Managing Editor Alicia Eler. Look for our next installment on July 9, 2013.